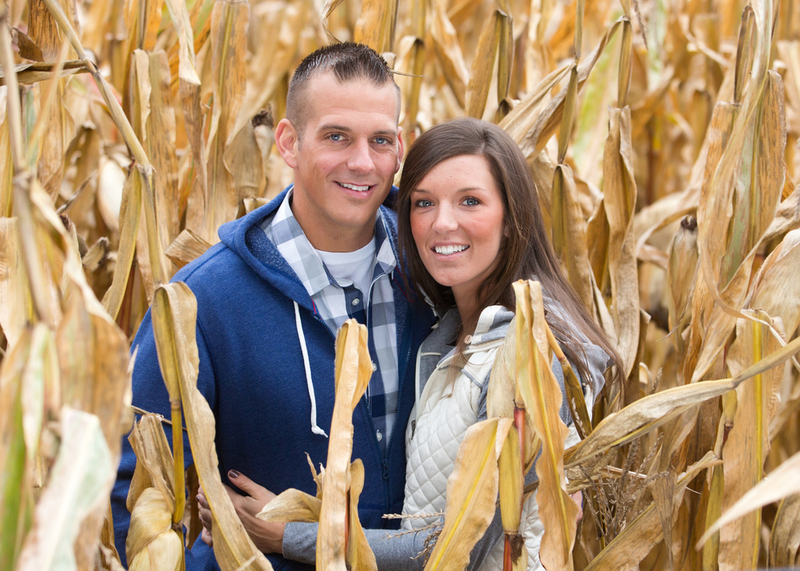 These stunning romantic engagement photos are of Ashley and Steve at The Morris Estate in Niles, Michigan. The Chapel is built in the classic New England style with a tall spire and all white exterior and interior, modelled on the famous Saint Martins-in-the-Fields in Trafalgar Square, London, and situated in a mature Maple forest next to the Saint Joseph River. Ashley & Steve are a beautiful couple and their love and devotion to each other shines through. Ashley had carefully chosen the clothes to match with different environments and both casual and more formal. It was such fun to photograph such a fun couple in such beautiful settings. Additional to the brilliant Fall Leaves and the Chapel, there are many other wonderful photo opportunities. A stand of tall pines, corn fields, and charming pond in the forest and an authentic wooden Covered Bridge, which is only available to couple that book their wedding at The Morris Estate and their photography with HOPKINS STUDIO.